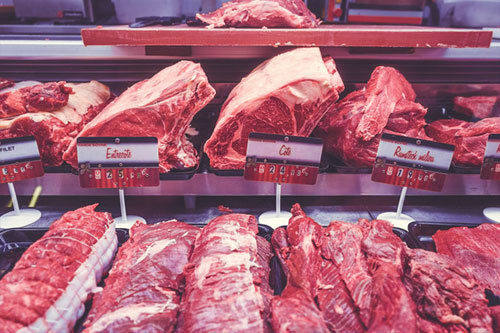 In this article, you will find out 6 biggest trends that affect the European bovine meat market. The growth in global demand, the opening of Asian markets and other factors related below will help you to better understand this market. This increase in global demand is triggered by a higher standard of living in some countries which means that consumers are eating more red meat, and the fact that production is too low to meet domestic demand in certain cases. In Asia, the bovine meat demand increased by about 3 % a year during decade 2003-2012. There is also a growing demand from other countries in Asia like Vietnam, Malaya, Philippines, but also from Latin America and the Middle-East. The predictions of global demand of bovine meat remains clearly on the upside for the next years (+ 1,8 % per year between 2012 et 2021 according to the FAO et OCDE). Since the early 2000’s, the three main importing countries of bovine meat are The United-States, Japan and Russia. They alone absorb 1/3 of world supplies on bovine meat, followed by South Korea, Egypt and China. There is uncertainty regarding the production and consumption of bovine meat in China as well as its import openness. This could have major implications on world transactions. Brazil’s exports are decreasing. This is due to sanitary parameters, to the scandals of last spring, but also to the dynamic of domestic demands (increase consumption of bovine meat), the evolution of prices for crops (dramatic rise of sugar price and soybean, inciting the farmers to invest further work on these types of cultivation) and the rise in the rate of change of Real whiwh hampers the competitiveness of Brazilian exports. The European production of bovine meat, decreasing since the beginning of 2000s thus find a development opportunity in the export. These imbalances between supply and demand are responsible for a significant rise of prices. 2 – L’ouverture des marchés asiatiques. Asian countries import more and more bovine meat: among them, there is China, but also Vietnam (part of which destined to China), Indonesia, Korea and Japan. Very selective to health authorities so far, China is opening up gradually, even if this opening is highly dependent on any health problem. The Indian meat until then approved by a large majority for its price, in particular by its nearby countries, has its production stopped. The government has forbidden the transport of cattle to the slaughter houses, leading to violent tensions in the country and thus penalizing the business of beef. Indeed, the livestock carriers, but also the breeders, the storekeepers and families suspected to consume beef expose themselves to the lunching. They dread militias and police, Indian extremists accusing the slaughterhouses of killing cows, considered as sacred. The main beneficiaries of these changes are Brazil, Australia, the United-States and Europe. Algeria, for example, has a part of its massive (until now) Indian beef exportations displaced by a little of French meat. India, the world’s leading exporter might eventually become an importing country. This could totally disturb the global exchanges. This phenomenon can be explained by a general increasing of the GDP of the countries of this region but also because they can handle the ritual slaughter and because they value the “fifth quarter” that is to say leather and offal. Some countries want to develop fattening to ensure food independence. Thus, they import lean animals. The Middle East is one of the main live cattle buyer but the demand has also increased in Israel, in Jordan and especially in Turkey. As a matter of fact, Turkey aims at increasing its cattle and 60% of cattle living in Turkey are coming from Brazil, Uruguay and European countries which deliver 40% (especially Ireland). European global consumption of pieces of meat has been following a downward trend but the differences between countries are large. For example, according to the data coming from the European Commission, in Italia, meat purchases declined of 4.4% during the 9 first months of 2017 in comparison to the same period of 2016 when they declined of 5.8%. In Spain, bovine meat household purchasing decreased of 4% at the first semester. However, processed meat purchases levels remained (+0.8%). On the contrary, in the UK, fresh or frozen beef purchases keep growing (+1.4%), thanks to grilling pieces (+6.4%) and marinated products (+7%). Frozen ready to eat dishes has also increased of 5.4%. Beef consumption in France stands for 68% of the total meat consumption, but it has decreased regularly, especially for young generations. For economic reasons (too expensive), especially because of the 2008 economic crisis, consumption has switched to plant-origin proteins. The increasing sensibility of occidental consumers for production and transformation conditions (animal welfare, environmental issues, new relations to nature, and need for proximity) provides guidance on their choice to reduce meat consumption. The population ageing and health concerns are help this structural trend. The consumer removal from the agricultural world influences consumption trends, especially by his need for transparency and information. Insects, yeast and seaweed based products are becoming popular. Plant-origin proteins (used as ingredients) consumption should continue to grow in the following years. Its nutritional value and particularly organic crops development are growth factors. However, its prices, often high, are limiting factors. The beef market is linked with milk market: when milk prices are more favourable, as it is the case now, there are less dairy cows on the market. After four years of growth, the European herd is stabilizing according to the latest Community census. The milk crisis has led to more dairy cow reforms and farmers have kept fewer heifers to restore cow herd. The dairy herd is declining by 1% from the 2016 records. The suckler herd, half the size, remained stable. In France, the herd of dairy cows is still declining (-0.7%) while that of suckler cows has not changed much (-0.1%) (While the French cattle herd has been growing since 2014). On June the 6th 2017, the European Union and Japan signed an agreement in principle on the main elements of an economic partnership agreement, the JEFTA. This agreement will eliminate almost all customs duty. Many products are indeed, currently taxed. A staggered cut in duties has been concluded for beef, going from 38.5% to 9%. The numerous procedures to follow on the Japanese market are also an obstacle for European exports. These procedures persuade EU exporters not to do what is necessary to obtain all the required authorizations. This agreement will result, at the trade level, in a partial or total liberalization of trade and a substantial increase in European exports of beef to Japan. In return, Japan will benefit from zero-rate access to the EU market for virtually all of its agricultural and food products such as beef. The agreement between the European Union and Canada, the CETA (Comprehensive Economic Trade Agreement) entered into provisional application at the end of September 2017 but remains likely to be challenged by the possible rejection of one of the national parliaments of the EU. Its application is expected to result in a generally limited increase in European imports of Canadian beef. The agreement is planning to establish a specific, hormone-free beef sector in Canada for export to the European Union but without any guarantee on animal welfare, animal feed and antibiotic administration issues as growth promoters. The European market is a benefit for Canada because it can allow the valuation of back cuts of meat-type cull cows, which are usually used for minced meat. The lower the level of cut, the more competitive Canadian products are against European products. Imported meat could therefore be essentially high-quality rear parts, mainly for the European out-of-home catering market. Competition should therefore increase for the parts that constitute the heart of recovery of carcasses from cull cows and heifers of meat breeds. France, where consumption mainly concerns cull cows, could be particularly affected. At a meeting in Brussels at the end of September 2017, the European Commission proposed to the EU Member States to accept the entry of a quota of 70 000 tons of beef (and ethanol) from Mercosur hoping to expand opportunities for its cars. The President of the European Commission, Jean-Claude Juncker, said indeed, that he wanted to “do everything” in favor of an agreement with the Mercosur trading bloc before the end of 2017. France opposes the proposal of the European Commission and the French President recalled the “need for a balanced policy between openness and protection to recreate confidence in trade” and should make proposals in this direction. Other countries, such as Spain, are expecting a lot of this agreement. The Commission also announced the upcoming opening of talks with two other countries where agriculture plays a major role: Australia and New Zealand. The beef market in Europe is therefore directly linked to international trade. The current big disturbances are causing a real shortage of meat and prices rising sharply. The future remains uncertain for the moment. We put shapes in the spotlight in our new tasting box ! Do you know the « finger food » ?